While Reuben Stoby and Rosmond Johnson were securing a repeat of their respective Mourant Ozannes College Classic Series titles, young Sam Potgieter was stealing the show with another record run to close the One Mile Division. Potgieter lowered the 6 minutes 34.56 seconds time he ran on Oct., 2 to 6:33.87, to wrap up the series unbeaten and claimed the One Mile title. Stoby was the overall 2 Miles winner in 11:23.39 while Johnson took the Women's Division in 14:30.69. "I came out hoping to run a bit faster and I went out hard and tried to beat the crowd, but on the hills, I slowed a lot," Stoby noted. "I ended up running 11:23, just around my personal best on this course, but I'm not too disappointed though. It's within what I should be running at this time and it's a warm up for the BVI Half Marathon in early December. The series was part of speed work and this week I only did long runs, so, I'm very happy for today's run." Johnson said her plan was to win the final race. "I had been doing a little speed training and tried to run up hills a little," she said. "I made up my mind this morning that I'm not going to lose today. I did two races and missed one when I went away on holidays. I won the first one and this is my second victory, which made me the series overall winner." Zebalon McLean who ran in the first College Classic Series race on Oct. 19, 1996, has only missed seven races and has participated in the series for 20 of it's 21 years of existence. "I'm glad to see that is has been carried-not by athletes-but by regular people who comes out for the exercise," he said. "I think the one unique thing about the College Classic Series is that it offers something for everyone, walkers, runners, joggers-even people who are not interested in running would come out because you have this camaraderie and you have the company of other people to pull you along." Final Results. One Mile (Under 9 & 11), Boys: 1. Sam Potgieter, 6:33.87 (New Record. Old Record, Potgieter, 6:34.56, Oct 2, 2016). 2. Charlie Potgeiter, 7:06.04. 3. Niklaus Vorgel, 7:27.97. 4. Antuwn Maduro, 7:39.15. 5. Jalem Cameron, 7:39.43. 6. Latriel Williams, 7:55.39. 7. Malik Christopher, 8:00.34. 8. Connor Chalwell, 8:44.87. 9. Caleb Quayle, 9:06.36. 10. Seun Frett, 11:49.86. 11. Lemuel George, 12:00.53. 12. Zaviyon Beazer, 12:40.52. 13. Joshua Tobin, 13:41.09. 14. Oliver Tobin, 14:08.87. 15. D'Mari Malone, 14:26.90. 16. D'Moi Malone, 15:27.30. 17. Eli Ghiorse, 16:40.00. Girls: 1. Asia McMaster, 7:55.92. 2. Nejma Robinson, 7:56.95. 3. Martha Killourhy, 8:48.73. 4. Olivia Quayle, 8:58.53. 5. Taryn Augustine, 9:13.71. 6. M'Kenzii Crabbe, 9:39.69. 7. Jomauria Levon, 9:45.28. 8. Lily Smit, 9:45.99. 9. Sofia Chilton, 9:51.23. 10. Kijana Callwood, 10:50.56. 11. Amarisa McLauren, 11:12.73. 12. Ava Ghiorse, 11:13.11. 13. Elizabeth Ormond, 11:32.32. 14. Amelie Tobin, 12:12.33. 15. Princess Vergel, 12:12.90. 16. Nia Wallace, 12:20.09. 17. Raina Chalwell, 12:37.23. 18. Subrena Gayle, 12:37.62. 19. Fantasia Reid, 12:40.23. 20. Z'Hara Mclean, 13:13.35. 21. Jardiana McLean, 13:26.20. 22. Alea Williamson, 14:48.12. 23. Chanecia Pinnock, 15:48.85. Two Mile, Men: 1. Reuben Stoby, 11:23.39. 2. Julius Farley, 11:48.16. 3. Samuel Romney, 11:48.94. 4. Patrick Ormond, 13:49.81. 5. Adrian Dale, 14:20.46. 6. Ikyjah Williams, 14:29.65. 7. Claudius Rhymer, 14:43.86. 8. Keven Nisbett, 15:09.31. 9. Jayden Augustine, 15:09.53. 10. Marcus Butler Jr., 15:36.66. 11. Reu Rhymer, 15:41.54. 12. Alric Smith, 15:45.03. 13. Malik Romney, 16:10.49. 14. Chad Willock, 16:15.03. 15. Jerry Thomas, 16:31.85. 16. Luther Butler, 16:43.62. 17. Zebalon McLean, 18:15.05. 18. John Cullimore, 18:24.74. 19. Howard Moore, 18:38.39. 20. Kadeem Hackshaw, 18:41.41. 21. Elvette Dore Sr., 18:51.51. 22. Hargeli Harrigan, 19:10.13. 23. Jim Cullimore, 19:39.51. 24. Hadley Chilton, 19:51.68. 25. N'Khoy Stoutt, 20:54.62. 26. Bill Kinkead, 21:28.98. 27. Jordan Dawson, 22:22.49. 28. Barry Leon, 23:54.83 29. Kyan Robinson, 25:14.41. 30. Matai Frett, 28:52.62. Women: 1. Rosmond Johnson, 14:30.69. 2. Kay Reddy,16:17.08. 3. Laura Dore,17:09.55. 4. Jahtivya Williams,17:30.01. 5. Sarah Carroll,17:38.50. 6. Philomena Robertson, 18:26.79. 7. Amy Quayle, 19:36.28. 8. Akeela McMaster, 20:37.61. 9. Shirley Liburd, 22:03.49. 10. Michelle Dennis, 23:24.37. 11. Cardella McMillan, 26:39.52. 12. Denise Frett, 29:57.06. 13. Natasha Chalwell, 30:05.08. Primary Schools Teams: Cedar School Primary (CS), Francis Lettsome Primary (FLPS), Joyce Samuel Primary (JSPS), Pelican Gate (PG), Willard Wheatley (WWPS). 1..M'Khori Crabbe (JSPS), 16:31.28. 2. Jahshani Farrington (FLPS), 16:39.62. 3. Angel Beato (JSPS), 18:07.40. 4.Jahnare Farrington (FLPS), 21:29.23. 5. Kavon Wheatley (FLPS), 21:45.64. 6. Kianjah Roberts (JSPS-1), 21:51.56. 7. Makeda Gumbs (JSPS-1), 22:00.47. 8. Jayden Fahie (JSPS2), 22:30.68. 9. Jesse Cockburn (JSPS-1), 22:50.65 10. Anjeni Benjamin (JSPS-1), 22:52.52. 11. Jessimee Estridge (FLPS), 25:15.74. 12. Cheyanne Castello (FLPS), 26:38.59. 13. Litzy Beato (JSPS2), 29:20.13. 14. Sanjay Henry (JSPS1), 30:58.78. 15. Anica Penn (JSPS2), 32:00.30. Points: 1. Joyce Samuel Primary Team 1, 33 2. Francis Lettsome, 34 . 3. 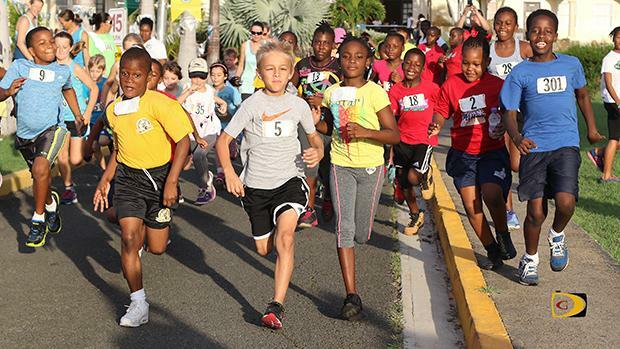 Joyce Samuel Primary Team-2, 53 (4 participants). Points: By Teams/Houses: 1. Cedar School. Service Clubs: Rotaract Club (RC), Rotary of Road Town (RR), Rotary Sunrise of Road Town (RS), Rotary of Tortola, (RT): 1. 1. Michael Killourhy (RT), 12:45.40. 2. Saungie Liburd (RC), 15:04.75. 3. StacyAnn Wynter (RT), 16:33.05. 4. Devon Letteen (RS), 17:20.57. 5. Vanessa King (RT), 17:25.87. 6. Tamara Cameron (RS), 18:27.03. 7. Adenike Flax(RS), 18:59.92. 8. Marvin Flax(RS), 19:09.49. 9. Henry Creque (RT), 19:09.84. 10. Richard Parsons (RR), 20:04.05. 11. Allison Gumbs (RC), 20:17.03. 12. Audley Maduro (RT), 21:14.75. 13. Jevaughn Rymer (RC), 22:15.76. 14. Monique Peters(RS), 22:58.81 15. Nadine Joseph (RT), 28:59.21. Points: 1. Rotary of Tortola, 30. 2. Rotary of Road Town Sunrise, 39. 3. Rotaract, 26 (3 participants). 4. Rotary of Road Town, 10 (1 participant). Community Partners: BVI Swim Team (BVISWIM), Cedar School Parents/Teachers (CSPTA), Digicel (D), H. Lavity Stoutt Community College (HLSCC), Joyce Samuel Parent/Teachers (JSPTA), Montessori Parent/Teachers (MPTA), Peligan Gate Parent/Teacher (PGPTA). 1. Kedrick Matthews (Digicel), 13:47.06. 2. Brendon Menton (DIG), 15:43.79. 3. Anna Kinkead (CPTA), 16:29.22. 4. Matthew Cockburn (JSPTA), 17:05.09. 5. Martin Cherry (HLSCC), 18:17.46. 6. Elizabeth Buratti Clifton (MPTA), 19:35.92. 7. Garfield Nieta (MPTA), 19:48.70. 8. Juliane Potgieter (MPTA), 22:01.62. 9. Michelle Vergel (PGPTA), 22:24.95. 1. Alcurt Mitchell (PGPTA), 23:19.70. 1. Tricha Mitchell (PGPTA), 24:12.34. 12. Cydrena Roberts (PGPTA), 24:30.28. 13. Adas Sanesez (PGPTA), 25:13.24. 14. Kevin Gordan (Digicel), 27:40.95. 15. Lynette Gumbs(PGPTA), 29:17.96. 16. Swain Henry(Digicel), 30:40.84. 17. Bernice Magloire (Digicel), 30:56.86. Points: 1. Digicel, 48. 2. Pelican Gate PTA, 55. 3. Montersorri PTA, 21 (3 participants). 4. Cedar School PTA, 3 (1 participant). 5. Joyce Samuel PTA, 4 (1 participant). 6. HLSCC, 5 (1 participant). Overall Male: 1. Reuben Stoby (2nd consecutive) 2. Julius Farley, 3. Samuel Romney. Overall Female: 1. Rosmond Johnson, 2. Kay Reddy & Laura Dore, 3. Philomena Robertson. Overall One Mile Male: 1. Sam Potgieter (NR: 6:33.87), 2. Charlie Potgieter. 3. Rush Broderick & Malik Christopher. Overall One Mile Female: 1. Asia McMaster, 2. Olivia Quayle, 3. Martha Killourhy. U9 (One mile) Male: 1. Charlie Potgieter, 2. Malik Christopher, 3. Latriel Williams. U9 (One mile) Female: 1. M'Kenzi Crabbe, 2. Taryn Augustine, 3. Chanecia Pinnock. U11 Male: 1. Sam Potgieter, 2. Rush Broderick. 3. Kael Chalwell. U11 Female: 1. Asia McMaster, 2. Olivia Quayle, 3. Martha Killourhy. U13 Male: 1. Jaden Augustine. 2. Matai Frett. U13 Female: 1. Jahtivya Williams. 2. Akeela McMaster. 3. Abriel Magloire. 30-39 Male: 1. Reuben Stoby, 2. Julius Farley, 3. Patrick Ormond. 30-39 Female: 1. Amy Quayle. 40-49 Male: 1. Zebalon McLean, 2. Claudius Rhymer. 40-49 Female: 1. Rosmond Johnson, 2. Philomena Robertson, 3. Laura Dore. 50-59 Male: 1. Adrian Dale, 2. Elvette Dore Sr.
50-59 Female: 1. Kay Reddy, 2. Sophia Dabbs. 60+ Male: 1. Howard Moore. 2. Jim Cullimore, 2. William "Bill" Kinkead. 60+ Female: 1. Shirley Liburd. Cross Country; Primary: 1. Joyce Samuel Primary-1. 2. Francis Lettsome Primary, 3. Joyce Samuel Primary-2. Secondary: 1: Cedar School Service Club: 1. Rotary of Tortola (12th consecutive), 2. Rotary of Road Town Sunrise, 3. Rotaract Community Partners: 1. Digicel, 2. Cedar Parents/Staff, 3. Pelican Gate PTA.